What is the difference between a Re-share, Repin and Reach? Learn about these terms and see how your Tribe has been adding to the engagement of your content. What has this Tribe done for you lately? 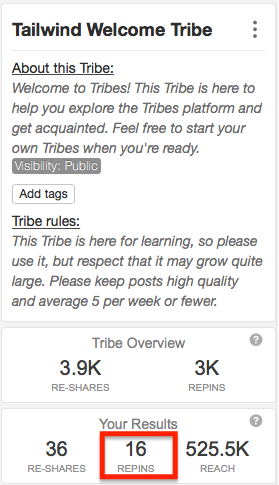 In your Tribe we'll give you the number of Re-Shares, Repins, and Reach to find the activity and engagement YOUR content has received from all of the other members of the Tribe! Helpful Tip: Hover over each metric for an explanation of what each metric means in case you forget. 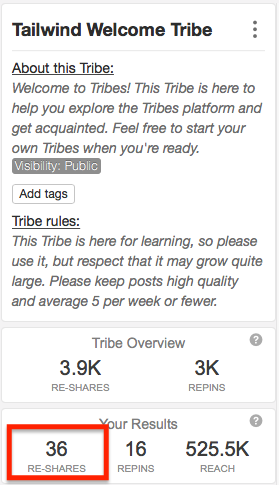 The number of times that your Tribe mates have shared your content. In other words, this is how many times someone has scheduled and published your content from this Tribe. 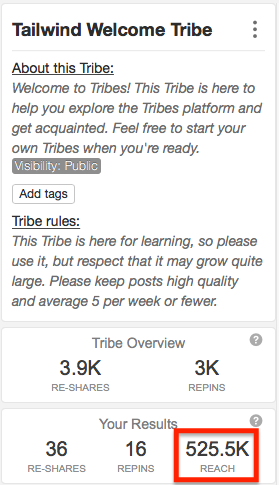 A lot of Re-Shares (not just including rule based sharing) is a really good indicator that you've been contributing quality content to the Tribe! The number of Repins generated from all the re-shares of your content. It can be helpful to see how much engagement you are getting from the content your Tribe mates have shared and if that content is resonating with their audience. The number of Potential Impressions from all Re-Shares of your content on Pinterest. Potential Impressions are measured by the number of Pinterest followers a Pinner has multiplied by the number of times they have Pinned your content. This number represents how many times your content may have surfaced in front of fans after being Pinned. The more Influential each person who Re-Shares your content is the larger your Potential Impressions (Reach) will be.